Life Before the Dinosaurs: Scenella. Scenella (sen-ELL-uh) was an animal that lived from Cambrian to Ordovician. Although most people believe that Scenella was a monoplacophoran (which is a mollusk that looks like a clam with only one shell, and moves around on the sea floor with a squishy foot like a snail), some people now believe that Scenella could be related to today's Valella (also called the by-the-wind sailor) or the Portuguese Man o' War, floating on the top of the water. Scenella was abundant. Individual fossils of Scenella have been found in groups, with some individuals overlapping each other. 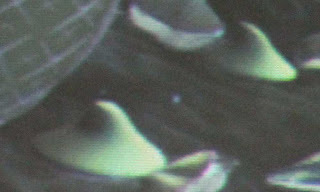 Scenella had a flattened conical shell, where the cone appears to be partly squished flat. Scenella was probably good prey for predators such as Opabinia and Ottoia, because it was slow, defenseless, and easy to catch. Since Scenella was so tiny and there were so many predators around, Scenella was probably at the bottom of the food chain. 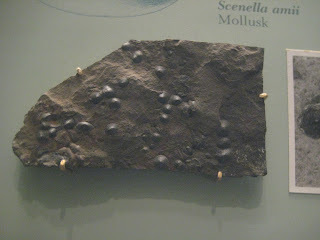 This fossil shows what a group of Scenella looked like. Huge predators like Anomalocaris, Amplectobelua, and Hurdia probably didn't bother to eat Scenella, because it was much too small for the big predators to eat. Scenella probably ate detritus and algae, like most other small snail-like animals from the Cambrian Period.